Adam Lerer is Research Engineer at Facebook AI Research, where he works on distributed neural network training, computer vision, visual common sense, and graph embeddings. Prior to joining Facebook, Adam worked at D. E. Shaw Research, where he developed software and algorithms for Anton, a special-purpose supercomputer for molecular dynamics simulation. Adam holds a B.Sc. in Computer Science and Physics and an M.Eng. in Computer Science from MIT. 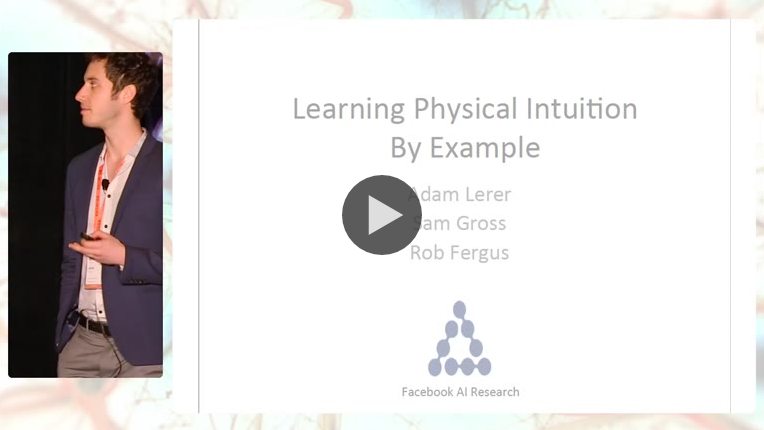 At the 2016 RE•WORK Deep Learning Summit in Boston, Adam held a presentation on 'Learning Physical Intuition by Example'. View his presentation and slides in the video below. Babies are known to acquire visual "common sense" concepts, such as object permanence, gravity, and intuitive physics, at a young age. For example, infants play with toy blocks, allowing them to gain intuition about the physical behavior of the world at a young age. While deep neural networks have exhibited state-of-the-art performance on many computer vision tasks, more complex reasoning (e.g. "What will happen next in this scene?") requires an understanding of how the physical world behaves. We explore the ability of deep feedforward models to learn such intuitive physics. Using a 3D game engine, we create small towers of wooden blocks, and train large convolutional network models to accurately predict their stability, as well as estimating block trajectories. The models are able to generalize to new physical scenarios and to images of real blocks. Watch more video presentations on the RE•WORK video hub and our YouTube channel. Hear the latest AI advancements at Facebook from Soumith Chintala, Research Engineer, and Antoine Bordes, Research Scientist, at the Machine Intelligence Summit in New York, on 2-3 November.